In 2015–16, the citrus industry was valued at $568 million (LVP). 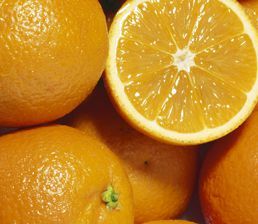 It is Australia’s largest fresh fruit exporting industry by volume, with citrus exports (oranges, mandarins, lemons, limes and grapefruit) totalling 260,209 tonnes worth $427 million in 2017. Total production of citrus was estimated to be 750,000 tonnes, produced from about 26,000 hectares of citrus plantings nationally. Major export markets include China, Japan, Hong Kong, Malaysia, Indonesia, United Arab Emirates, Singapore, the United States and Thailand. Citrus fruits are grown commercially throughout the Australian mainland excluding the ACT. Major growing areas include the Riverina in NSW; Central Burnett and Emerald in Queensland; Riverland in SA; and the Murray Valley in Victoria/NSW. Production also occurs in WA and there are a small number of plantings in the NT. The Citrus Biosecurity Project, boosting the preparedness of the citrus industry for serious exotic pests, concluded in 2017. The outreach program was funded by Hort Innovation and jointly managed by PHA and Citrus Australia. A new project has commenced with a focus on coordinated surveillance for exotic pests. 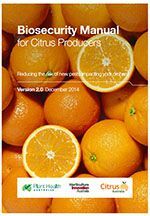 The citrus industry is covered by version 3.0 of the citrus biosecurity plan and the Biosecurity Manual for Citrus Producers Version 2.0. 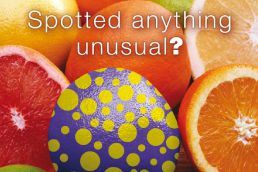 Biosecurity planning provides a mechanism for the citrus industry, government and other relevant stakeholders to assess current biosecurity practices and future biosecurity needs. Biosecurity planning identifies procedures that can be put in place to reduce the chance of pests reaching our borders or minimise the impact if a pest incursion occurs. 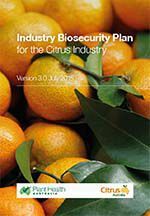 The Biosecurity Manual for Citrus Producers contains information to help producers to implement biosecurity on-farm. Manuals usually contain an overview of biosecurity, fact sheets to identify the high priority pests of a crop, tips on crop management, and how to manage people, vehicles and equipment to minimise biosecurity risks. Manuals also contain a biosecurity self-assessment list, and templates to record pest surveillance records and visitors. More information about on-farm biosecurity for both plant and livestock producers is available from the Farm Biosecurity website. 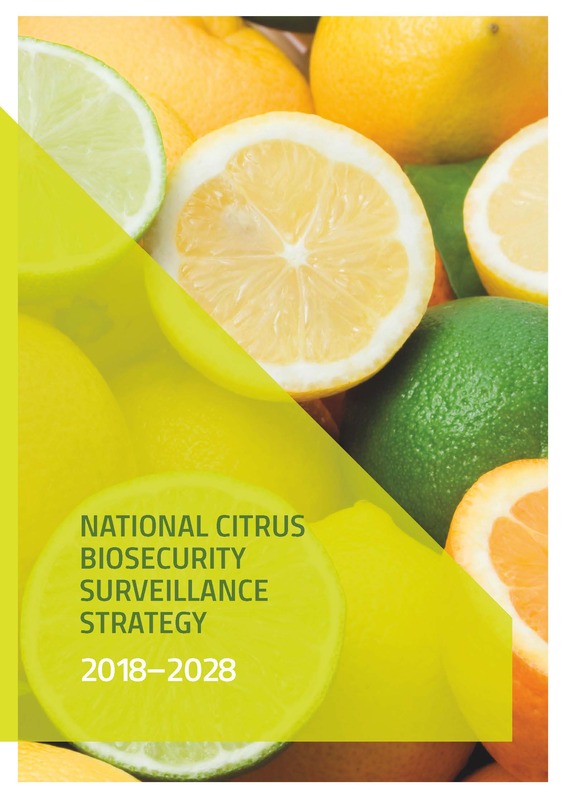 The National Citrus Biosecurity Surveillance Strategy has been developed to provide a framework for national coordination and implementation of surveillance activities carried out by government and industry for exotic citrus pests and pests of market access concern. The strategy's four Goals and twelve Actions form the basis of an implementation plan. The Actions aim to strengthen national surveillance efforts to detect incursions of exotic citrus pests and improve the understanding of pest status to support access to markets. The following is a list of high priority exotic pests of citrus. These pests were identified during the development of the Industry Biosecurity Plan for the Citrus Industry in consultation with industry, government and scientists. They have been assessed as high priority pests based on their potential to enter, establish, and spread in Australia (eg environmental factors, host range, vectors) and the cost to industry of control measures. The following is a list of documents for other exotic and endemic pests of the citrus industry. Please note that this is not a complete list of pests: rather it includes pests for which documents exist in the Pest Information Document Database. Some of the documents presented here are not tailored to the citrus industry and are included for information only.